Should I Renovate My Home All At Once Or One Room At A Time? You know you want to renovate your home, but you’re not sure about the best way to go about it. It’s a great way to improve your quality of life at home, increase your property value, and make better use of space. But how much should you take on at once? There are several reasons to do your renovations all at once. Primarily is the ability to achieve a consistent look through your whole home. 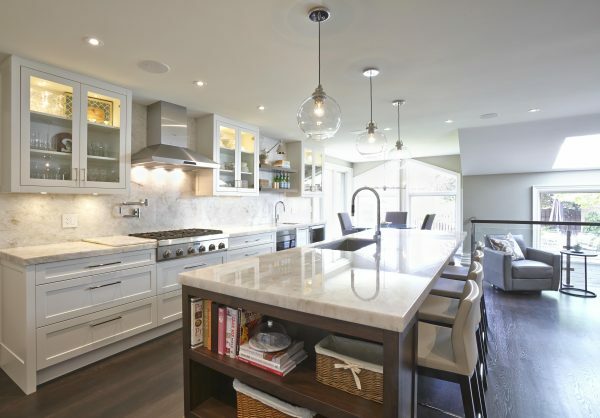 Performing a full-home renovation means you have a cohesive design as all work is completed at the same time. For example: refinishing the hardwood flooring one room at a time, could mean that the colour of the floor is not consistent as stains, sanding and even humidity can affect how a wood stains. If you are putting hardwood flooring into areas that need to be replaced, stock, suppliers and purchasing at different times can also affect the consistency of the materials. 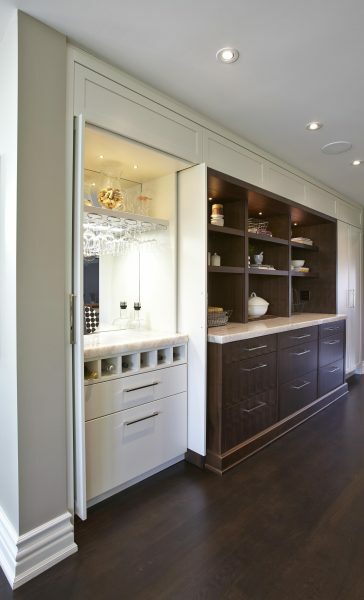 Doing all your renovations at once allows your interior designer to create a consistent look for each room. This gives the house a better flow and is more cohesive. 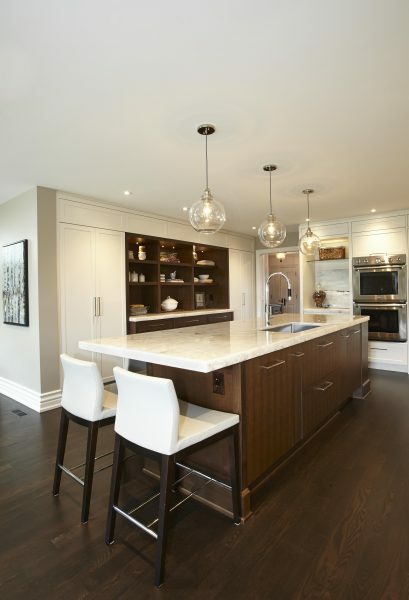 Although we have done home renovations in stages, we always try to address concerns of common finishes that may need to run through the entire house that straddle phases of the renovation and how to manage them. Another design advantage of doing a full renovation is that all materials can be ordered to match. Materials like stone can be very difficult to match if purchased years apart. There is nothing worse than having a grand design vision that has to be abandoned or compromised because the materials are no longer in stock. Budget is one of the most important factors in this decision. If you can afford to renovate your whole home at once, we will generally recommend it. While the initial cost is higher than renovating one room at a time, it is much cheaper in the long run. The full-home renovations cost less in the long run because it is efficient. In addition to getting everything out of the way at once, it also means the overall labour costs will be lower. Every project requires set-up. Doing projects one room at a time means paying set up costs multiple times. For example, if you are having the floors done in the living room you will have to pay for the set-up costs when the labourers prep the floor. If you do the kitchen floor at a later date, you will again have to pay for someone to come in and prepare that floor. Having both floors set up at once would require one visit instead of two, thereby being more cost effective overall. In the same vein, there are clean-up costs with any project. Doing all your projects at once means doing your clean up all at once. This means less labour hours and cleanup equipment only has to be brought in once. The same logic applies to garbage removal and dumpsters. Specialists like electricians and plumbers are generally brought in on a per day or contract rate. Doing a full home renovation means you get a full day’s work (or two or three) rather than paying for a full day when you only need 2 or 3 hours. mean that materials and design will match each other at least on a floor by floor basis. Are you able to rent somewhere in the meantime? Have you factored that cost into your budget? Do you have family or friends you could stay with during the project? How long are they willing to accommodate you for?What will you do if the project is delayed? If you can live elsewhere without a significant lifestyle change, then we would always recommend renovating your entire home at once. Even if you choose to do only a partial renovation, you may find you prefer to move out during the project. Living with a reno can be stressful. Construction can be noisy and messy, with workers coming in and out of your home every day. The dirt, dust, and construction materials are part of a renovation, however, they are not easy to live with. Doing a kitchen or bathroom renovation can be especially disruptive to family life. Can your family get by with just one bathroom to use? Mornings are a busy time with everyone needing to shower, brush their teeth, groom and prepare for their day. A household runs on its stomach. If the kitchen is out of commission, how will you prepare your meals, and where will you be eating them? From family dinner to midnight snacks, having access to a kitchen is critical to home life. The type of home you live in can be a factor in your decision as well. A condo renovation such as this one presents its own challenges. Neighbours may be unhappy with one renovation after another. It can be easier to get approval for, and to coordinate, one large renovation, rather than several small ones with the service elevator and condo board. For almost all projects inside of a condo, you will need to get board approval. While you do not always need building permits for condo renovations, you do always need condo board approval. You will need to submit a proposal as well as book parking and elevators for the job. We are also seeing more and more that condo boards are charging owners a fee, per month, for each month that they are renovating their condo. The idea is that there are additional costs to the common areas, either for vacuuming, damage or security. Deciding on a renovation is often characterized as a stressful and costly endeavour. We prefer to see it as an exciting opportunity. Renovating your home can have a positive impact on your life and family and we’re happy to help weigh in and discuss options. With professional guidance, the process should be a creative endeavour with a chance for you or your family to tailor the outcome to exactly suit your needs. Our role is as much guide as it is assisting in making good decisions about budget, timing and how to accommodate a partial or full renovation.